A counterfeit medication or a counterfeit drug is a medication or pharmaceutical product which is produced and sold with the intent to deceptively represent its origin, authenticity or effectiveness. 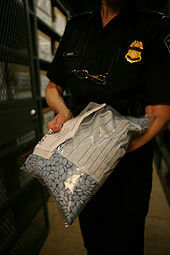 A counterfeit drug may contain inappropriate quantities of active ingredients, or none, may be improperly processed within the body (e.g., absorption by the body), may contain ingredients that are not on the label (which may or may not be harmful), or may be supplied with inaccurate or fake packaging and labeling, as is the case with homeopathic products. Counterfeit drugs are related to pharma fraud. Drug manufacturers and distributors are increasingly investing in countermeasures, such as traceability and authentication technologies, to try to minimise the impact of counterfeit drugs.Antibiotics with insufficient quantities of an active ingredient add to the problem of antibiotic resistance. Legitimate, correctly labeled, low-cost generic drugs are not counterfeit or fake (although they can be counterfeited), but can be caught up in anticounterfeiting enforcement measures.In that respect, a debate is raging as to whether “counterfeit productsfirst and foremost a threat to human health and safety or [whether] provoking anxiety [is] just a clever way for wealthy nations to create sympathy for increased protection of their intellectual property rights”.Generic drugs are subject to normal regulations in countries where they are manufactured and sold. Counterfeit medicinal drugs include those with less or none of the stated active ingredients, with added, sometimes hazardous, adulterants, substituted ingredients, completely misrepresented, or sold with a false brand name.Otherwise, legitimate drugs that have passed their date of expiry are sometimes remarked with false dates. Low-quality counterfeit medication may cause any of several dangerous health consequences, including side effects or allergic reactions, in addition to their obvious lack of efficacy due to having less or none of their active ingredients.